The Early TVR sports car. In 1946, Trevor Wilkinson set up Trevcar Motors in Blackpool with the aim of building cars. However, in 1947, he changed the name of the company to TVR Engineering. In 1949, the company built its first car based on the mechanics from a Morris Eight saloon, together with an aluminium body, and powered by a tuned 1172 cc Ford side valve engine, which developed 35 bhp. This model was duly called the TVR Number One. By 1952, the original car had been modified, in terms of mechanics and body work, and included a 1200 cc, 4-cylinder, overhead valve engine from an Austin A40, which developed 40 bhp. This version was referred to as the TVR Number Two, and it won a number of awards when entered in club sprints and hillclimbs. The TVR Number One and Two were both open sports cars with aluminium bodies. In 1953, TVR built a number of new chassis to accept the engine and mechanics from the A40, combined with a glass fibre body shell, which they duly sold as a kit car. This car was named the TVR Sports Saloon, and boasted a 0-60 mph time of 13 secs. The chassis was built to order, and the kits were offered with alternative body styles and engines, although the most common units were the 1172 cc Ford side valve, and 1200 cc overhead valve unit from the Austin A40. Early TVR customers would often just purchase a rolling chassis fitted with their chosen engine, and then make alternative arrangements for the choice of body. In 1955, the company designed a backbone-type chassis, whilst the body was developed by modifying parts of the body from the Ashley kit car. In 1956, the Jomar Mark 2 sports car, as it was now referred to, was built as a special order, which incorporated an aluminium body on the new semi spaceframe chassis, and was powered by a Coventry Climax FWA engine. Externally, the Jomar looked very much like the early TVR Grantura. Later that year, a Jomar style chassis was fitted to a restyled body and a Coventry Climax engine, and was referred to as the TVR Open Sports. A fixed head coupe version was then built, and was called the TVR Coupe. 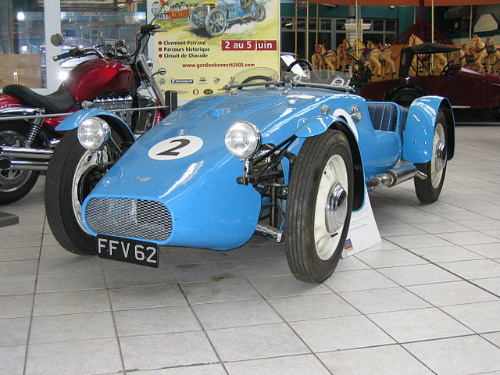 Engine options included the 1172 cc Ford 100E side valve, to which a Shorrock supercharger could be added, the 1100 cc Coventry Climax FWA unit, and the 1.5 litre unit as used in the MGA. One of the TVR Coupe models was driven by Mike Hawthorn in order to promote the company. By 1958, a six car team was set up in the US to race TVR's, whilst the Jomar sports model was entered in Formula racing. Following suggestions from the US race team, the existing body was now restyled to produce a fastback version utilising the existing chassis, which featured independent suspension front and rear. Since the body was fitted with narrow doors, and the steering wheel was quite large and almost vertical, this meant that access to and from the car was not easy. Cars fitted with a Coventry Climax engine received a plush leather interior, whilst those with a more standard specification were trimmed with vinyl. Initial production of the restyled fastback version was exported to the US, where they were designated the Jomar Coupe or Jomar GT according to the engine specification. Interestingly, some of these cars sported both Jomar and TVR badges at the front. Both variants used the same chassis. Almost all production was exported to the US, where the sport variant was referred to simply as the Jomar. By this time, it was felt that the name Jomar had run its course, and that a more emotive designation was required. The name Grantura was chosen in recognition of Grantura Plastics, who made the bodies. Hence, the TVR Grantura sports car was born.